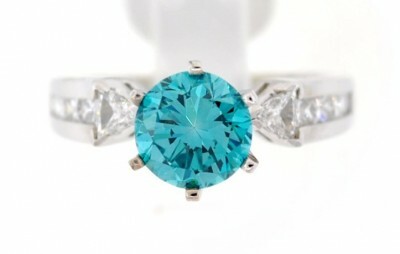 The prong setting, also called a claw setting, is the most desired gemstone setting and is often adopted for use in solitaire engagement rings. 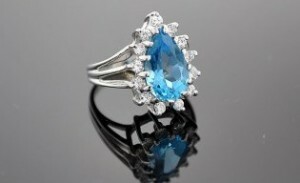 The diamond or gem is inserted into prongs that form a basket-like base. The ends of the prongs are bent over and shaped so that they rest against the stone. The visible prong ends are often rounded, but can also be found in ovals, points, V-shapes, left flat or even decorative forms. A prong setting can be tall, with the diamond crowned well above the ring’s band, or it can be short, with the stone resting closer to the finger. Channel settings are most traditional choice for wedding bands. Smaller diamonds and even gemstones are delicately placed in channels cut in the metal engagement ring shank. The stones are set in the ring shank alongside one another. Metal from the outer edge of the engagement ring is then folded over the edges of the stones to secure them firmly into the ring. This creates a smooth feel and adds to the elegance of designer wedding bands. Pave set engagement rings require the most precise selection of diamonds or gemstones. Small holes are drilled in the ring shank to hold tiny diamonds which are placed in rows and fill up the entire space on the surface without actually touching each other. After the diamonds fill their respective small holes tiny bits of metal from the surface of the shank are pushed over the edge of the diamond, forming tiny prongs to hold the stone in place. Each tiny diamond is cut with 58 facets and its look and feel contributes towards the elegant look of a pave set engagement ring design. The visual effect created by a carpet of glowing diamond and gemstones on the entire surface of the ring is the sign of a perfectly designed and well made engagement ring.